How Digital Marketing Companies in the USA Can Super-Charge Your Social Media Marketing. How Digital Marketing Companies in the USA Can Super-Charge Your Small Business Social Media Marketing. For many small business owners, gaining traction on social media is a mystery. How do you build a following and entice people to get interested in your brand? If this question haunts you, digital marketing companies in the USA can help. Here’s how. Digital marketing services can make your life so much easier when you want to advertise on social media. If you’re not targeting your ideal customer on social media, you should be. The right ad campaign will show these ads to a specific demographic (or range of demographics), ones you should be focusing on as ideal leads. Needless to say, this isn’t easy to do, but digital marketing companies can create ad campaigns for you that target the right people. Once your campaign is up and running, you don’t have to manage it. A digital marketing company will keep tabs on it and make sure it’s running smoothly. When you don’t have to think about growing your reach on social media, you can focus on other ways to use your expertise to grow your business. 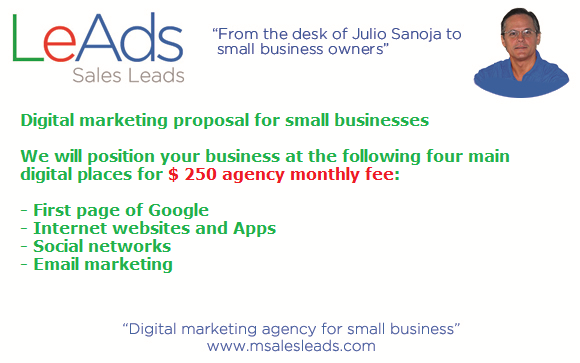 If you’re ready to get started with targeted, optimized ads to improve your social media marketing, count on MSalesLeads. This article was written by the Express Writers team.